Each of us has experienced some form of social rejection, loneliness or the sense that we don’t belong or fit in. Some of us have to spend quite a bit of time reflecting to remember those moments, while others can recall them immediately. Regardless of what we recall, what we can each recognize is how painful those moments were – and might still be. The desire to belong and be part of community is something I’ve written about both on here and on my blog for the past five years or so. The topics of community, connection and belonging hit home so deeply with me because of the struggles I’ve had feeling accepted, wanted, invited and included. I have journals going back to elementary school that chronicle the deep sense of sadness I felt as a result of moments of blatant rejection and feeling like I didn’t fit with my peers. This sense of not belonging is something I wrestled with into my early 30s. When we believe we are uncool, unwanted, timid, uninvited, “too much” or “not enough”, unpopular, soft-spoken or invisible, it’s hard to shift our mindset to believe anything else. We internalize it and assume it’s just who and how we are. All of those “un” words and phrases describe how I’ve felt about myself for much of my life, beneath my seemingly confidant facade of accomplishment and achievement. I know I’m not alone. Each of us carries narratives throughout our lives that shape how we see ourselves and how we engage with the world around us. These narratives tell us what we are worthy of, what is possible, how the world sees us, and whether or not we belong. Few of us stop to question whether the stories we tell ourselves about ourselves are true. We don’t pause to consider whether they’re based in reality or simply the product of fear, anxiety or what someone else projected onto us at some point in our lives. We continue to believe them, often to our own detriment. The belief that we don’t belong or aren’t wanted is more damaging than we might realize. In a recent study published in Perspectives on Psychological Science, four factors were identified as having an impact on early death – air pollution, obesity, excessive drinking and loneliness. According to the study, living with obesity increased the risk of early death by 20 percent, while living with loneliness elevated the risk of early mortality by a whopping 45 percent. Over 40 percent of Americans report feeling lonely, and that number goes up to 50 percent for CEOs. When we feel rejected socially, the center of our brain that processes emotions – the amygdala – goes into overdrive. It’s as though our very existence is at risk when we are socially rejected. Levels of inflammation rise and our immune system is compromised to prepare us to fight the threat. In the case of social rejection, there’s rarely a physical threat to defend, yet our brain responds and experiences the hurt the same way it experiences physical pain. We are starving for community and craving authentic, meaningful connection. That’s why feeling like we belong is so powerful…and healing. Though I’ve struggled to feel included and connected for much of my life, I’m grateful for the transformation I’ve experienced over the past two years. Sometimes we have to hit an inflection point before we change. Sometimes truth has to be reflected back to us before we can begin to see ourselves differently and rewrite our narratives, believing that we are worthy of what we want. This happened for me on my 33rd birthday. I’m sitting in the living room of a friend’s house. We’re going around the circle sharing stories, and I bring up a story of my infancy. I talk about feeling like I didn’t belong for most of my childhood and about the postpartum depression my mom had after I was born. I wouldn’t latch and ended up colicky and malnourished for several weeks as an infant. I tie that experience and others to the narrative I carry about being “too much” for people and about feeling like I don’t fit in or belong. In the minutes that follow, everything in me collapses. I start sobbing and crawl up into a ball as I let the weight of her comment pass over me and sink into me. For my whole life, I’ve believed one reality to be true about my place in the world – that I will always have to fight to belong and to prove my worth and value. But her truth cut through the story I had believed for so long. It offered a new reality. Before I was born, I was wanted. Over the past two years, as a result of moments like those, I’ve experienced a profound shift in my sense of belonging and connection. Recovering from Epstein-Barr Virus was the catalyst for a great deal of soul-searching, truth-seeking, and internal transformation. Instead of sitting back and waiting to be found, hoping that other people would invite me into their circles and their journeys, I’ve been putting myself out there, intentionally seeking out people, and believing I am worthy of belonging and connection. I’ve been invited to speak, write, and think in community with my peers, as we seek to rehumanize work. I feel like my presence is wanted, and not because people feel sorry for me, but because they genuinely believe that who I am contributes something to the greater good. I used to have pity parties on my birthday because no friends planned things for me. Now, I take ownership and think about what would bring me the most joy and then invite people into that experience with me. I want to be someone who makes other people feel like they belong and are included because I know how painful it is to feel the opposite. As a result of internalizing some radical candor from a few brave friends, I’ve shifted my perception of what it means to be in relationship with other people. It’s not about simply waiting around for my needs to be met, hoping someone will read my mind and give me what I need. My needs matter, but the world doesn’t revolve around me. I have to get outside of myself and begin to see other people’s needs as equal to my own. Whether we’re in line at the grocery store, waiting for a coffee at Starbucks, passing a coworker in the hallway at work, out on a date with a friend, or sitting next to a stranger on a plane, we have countless opportunities to connect with people who cross our paths, to make them feel like they belong. We never know what someone is going through, what kind of day they’re having or whether they feel like they belong or feel invisible. That’s why it’s important for each of us to do what we can to foster connection and make others feel seen, to smile at people and say “hello”, to acknowledge another person’s presence. To paraphrase the words of Colleen Reilly, connection is not a strategy; it’s a responsibility, one that we are all called to practice. This is not just another program or quick fix for the workplace. It’s a human imperative and something everyone can bring more of into the world. To connect at all is to risk, but I’m learning more and more each day that the risk is worth taking because of how deeply all of us want to belong. Connectedness is a universal human need and desire to belong, to feel like we are seen, heard, known and that we matter. When we experience a sense of belonging and inclusion, we are living in a state of connectedness. We feel grounded, safe, and accepted. We are hardwired for connection and need it to survive and thrive. It’s our very nature to be connected; it’s a fundamental element of who we are as human beings. We are born as a result of two people physically and emotionally connecting. We are transformed when we deeply connect with ourselves and healed through our connection with other people. In our increasingly distracted culture that is full of barriers, consistently and authentically connecting with other people has become a challenge. Even though it’s in our nature, it has become unfamiliar. In a recent conversation with my dad, we were talking about the dynamic of connection and why it seems to be elusive to people. Many of us have become so accustomed to distance in relationship that when we experience closeness and connection, we run from it. We don’t trust it. As a result, we end up living in a polarizing state – one in which we deeply crave connection yet keep our distance from it for fear of being exposed for our true selves. On the flip side, when we experience prolonged closeness and connection, we feel out of sorts in the midst of distance. We can no longer keep people at arms’ length because we know how healing and fulfilling it is to be in close connection with them. My church did a sermon series a few months ago, and one of the key concepts from one of the sermons was that community is a discipline. To be in connection with other people requires a certain level of thoughtfulness, intentionally and consistency. The discipline of community requires us to make time for other people when all we feel we have time for is ourselves. It requires us to show up consistently, even if we don’t feel like we are getting anything out of it. Maybe we are simply there in that particular moment to give, not just to get. It asks us to give others permission to be radically candid with us and to reflect back what they see that we might otherwise be blind to and miss. Being in community invites us to enter into and grow through conflict rather than run from it. All of these actions and ways of connecting require discipline and intentionality. Discipline is something we do even though we don’t want to in the moment, but eventually, it becomes a joy. When we practice day after day and are willing to risk rejection for the sake of authentic connection, we are transformed and healed and so are the people around us. As you continue on with your day, see if you can keep these four phrases from the retreat in mind, allowing them to influence each interaction you have as a way to foster deeper connection. What limiting narrative have you carried into adulthood about who you are and whether or not you belong that needs to be “brought to trial” and questioned? What would happen if you believed something else about yourself? How do your beliefs about yourself interfere with your ability to connect with other people in an authentic way? What masks are you hiding behind to protect yourself that prevent you from connecting? In what ways have you experienced a sense of belonging / feeling included? How did you contribute to that experience? How could you become more intentional and disciplined about pouring into community and fostering connection with other people? How could you begin to let people in and take the risk to connect? If you’re interested in learning more about my speaking and training topics, feel free to send me a message, check out my speaker reel, and connect with me on my blog. Two years ago, I sat across the desk from a speech language specialist at the Johns Hopkins Voice Center at GBMC. I scheduled an appointment to see him because I had lost my voice yet again and couldn’t figure out why my voice became strained so easily and so frequently. This issue has been ongoing for years – since college – but it happened inconsistently, so I couldn’t pinpoint how to fix it. It kept coming back. Since I speak for a living, not having my full voice and not knowing whether it would hold up and be strong enough to give a presentation concerned me. To add to that, I had been diagnosed about a decade ago with vocal nodules – hard, rough growths on my vocal cords that prevented me from using my full voice. I feared I was heading down that path once again. I went through a series of exercises to assess my voice, my breathing, and my tone. At the end of the session, the speech pathologist commented that I have a tendency to push my voice out with my breath, which creates strain and taxes my voice. Voice is released, not pushed. When we’re speaking and singing like babies do, we’re literally releasing air from inside our diaphragm over our vocal cords. That process creates sound. It’s effortless and easy, something we are born doing instinctively, not something we do consciously. On the other hand, when we push too much breath pressure and force air through the voice box, we can blow out the vocal cords. Pushing our voice is unnatural. It taxes our vocal cords and causes us to experience strain and even loss of voice. But I knew there was a deeper meaning to his words and that they extended beyond my voice. For much of my life, I’ve pushed myself, especially academically and professionally. I had natural talents for certain things like writing and creative thinking, but I never rested on my laurels and always did more than was necessary to ensure I’d ace every assignment. Failure wasn’t an option for me. It wasn’t long before I equated working hard and putting in extra effort with being successful. If something was easy, I assumed it was incomplete. I thought it had to be hard in order to be worthwhile. I was that kid that typed up my notes in the form of a study guide for every test, starting in middle school and running through college. I took perfectly good notes during class but had decided that not overdoing it would result in the unthinkable – something less than perfection. I’ve done the same in my professional life as well, ovedoing it and overdelivering for fear someone would deem my work (or, even worse, me) to be inadequate in some way. I pushed myself. I wanted to be in control. I made sure I did everything in my power to guarantee success. As I sat across from the speech pathologist, his words took on new meaning. I was called to release what was inside of me, not push or force it out. I’ve since reflected on some of the most meaningful and memorable moments in my life, particularly the ones that I didn’t orchestrate but simply invited in by being open. Bill and I have been together nearly 13 years and married for almost eight. On the final day of the DISH award application for WELCOA’s Top Health Promotion Professionals in the U.S., I applied. I was one of over 200 applicants and did it on a whim, not thinking anything would come of it. Five months later, I was named the #1 Health Promotion Professional in the U.S.
After giving an acceptance speech at their conference that spring, I wrote on the last page of my journal, “I will speak at WELCOA’s Summit next year.” I stored the journal in my nightstand and didn’t think twice about what I’d written down. Until four months later, when I received a phone call from WELCOA, asking me to speak at their conference the following year. In the months that followed, people started reaching out to me to do podcast interviews, and last year, some of my stories and words were quoted in three different books. I’ve been invited on retreats with other thoughts leaders around the country, not because I asked to be but because I was in my lane, doing my thing authentically and passionately, and other people were drawn to me. When I was diagnosed with Epstein-Barr Virus two years ago, I remember how hopeless I felt leaving the doctor’s office. Now what? How do I get better? I couldn’t force or will my body to recover. I had no answers and no direction. I couldn’t believe what I was reading. I immediately reached out to her, hopeful and confident that she could help me heal. She did, and she has since published a book called The EBV Solution that includes my story of recovery. When we are living in alignment with our calling and are on our path, we don’t have to force opportunities to happen. They will find us and be released into our care, sometimes falling right into our laps. We have to continue doing the work and keep showing up for what we’re called to do, believing that what is meant for us will not pass by us. It’s so easy to become distracted by what other people are doing, to become jealous of their opportunities or good fortune. When that happens, we can also feel resentful and bitter and get sucked into a vortex of comparison and feelings of inadequacy. Why do they get to do that? Why not me? When will I get my shot? That way of thinking steals our joy and perpetuates a scarcity mindset, something that has been a struggle for me. When we focus on forcing and pushing things, we end up feeling overworked, overextended, exhausted and inauthentic. The focus on what others are doing keeps us from doing our work and making our contribution. A life of peace and purpose is one in which we are released and freed to be ourselves, not forced to push our way through to get what we want. What you release comes from the depths of who you are and is uniquely, inherently, authentically you. This article was originally published on my LinkedIn page here. Pasta was one of my absolute favorite foods growing up. I ate it multiple times a week, usually with butter and a hefty helping of Parmesan cheese. Today’s recipe is an upgrade to my childhood pasta meals. I served it for the first time yesterday during a workshop I taught at my church about Summer Food Upgrades. It was a big hit! You could serve it for lunch or dinner or take with you to a picnic or cookout. It’s super simple to make and will definitely be a crowd-pleaser. I made it gluten-free by using brown rice pasta and dairy-free by using this paleo Parmesan cheeze. I used cannellini beans to boost the fiber and protein, which help keep us feeling full, and added some diced tomatoes and fresh basil for a pop of color. By making your own (simple!) dressing you’re also avoiding all of the extra gunk that tends to be in bottled salad dressings. 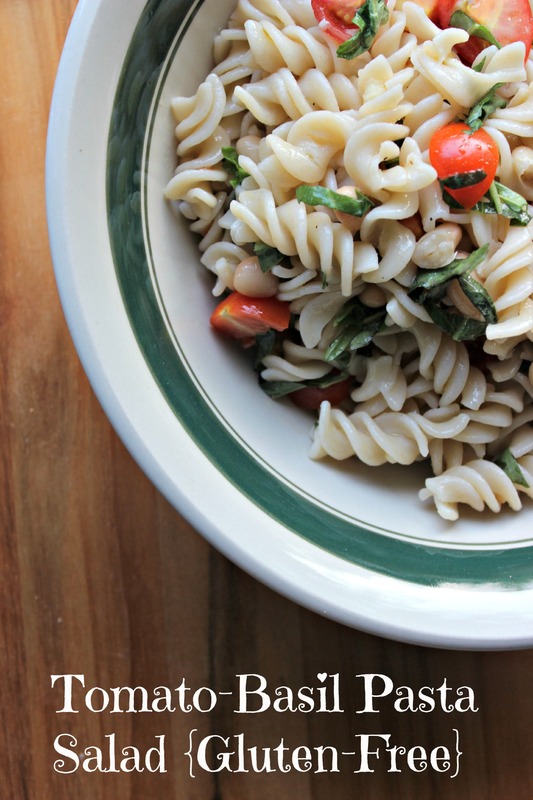 This dish is an all-around upgrade to the traditional pasta salad and tastes great, too! Cook pasta according to package directions, and rinse under cold water; drain and put into a serving bowl. Add beans, tomatoes, and basil. In a small bowl, whisk garlic, sea salt, lemon juice, olive oil, and black pepper. Pour over pasta, and toss to coat. Cover and refrigerate for at least 1 hour before serving. Take out 15 minutes before serving to allow to come to room temperature or keep it cold. Your choice! Sprinkle with this paleo Parmesan cheeze. An optional step is to add some spiralized zucchini noodles for an extra veggie punch! I will always remember my first Valentine’s Day with my then boyfriend, now husband, Bill. I’m super sentimental and have been known to pull the line, “You don’t have to spend a lot of money – just do something creative. I like homemade things.” Haha. This is an evil thing women do to men, but he always comes through for me, so it must be working! I feel blessed to be married to a man who knows the importance of romance and making me feel loved on Valentine’s Day and throughout the year. Since we are likely to be snowed in on Valentine’s Day this year, we decided to make the most of the time and whip up some yummy Valentine’s Day sweet treats! If you like peanut butter, chocolate, walnuts and almonds, you will like at least one (if not all) of these recipes! All the recipes are gluten-free, dairy-free, vegan, and raw, so everyone can enjoy them! They come from one of my favorite bloggers, Angela Liddon, at oh she glows. They’re listed in order of awesomeness. It should be no surprise that the chocolate peanut butter combo is the winner. It is AMAZING! Chocolate Peanut Butter Dip – oh my chocolatey peanut buttery goodness. That is all I will say…you HAVE to make this stuff…As tempting as it will be to literally drink the whole bowl, try dipping strawberries, bananas, or apples in it! 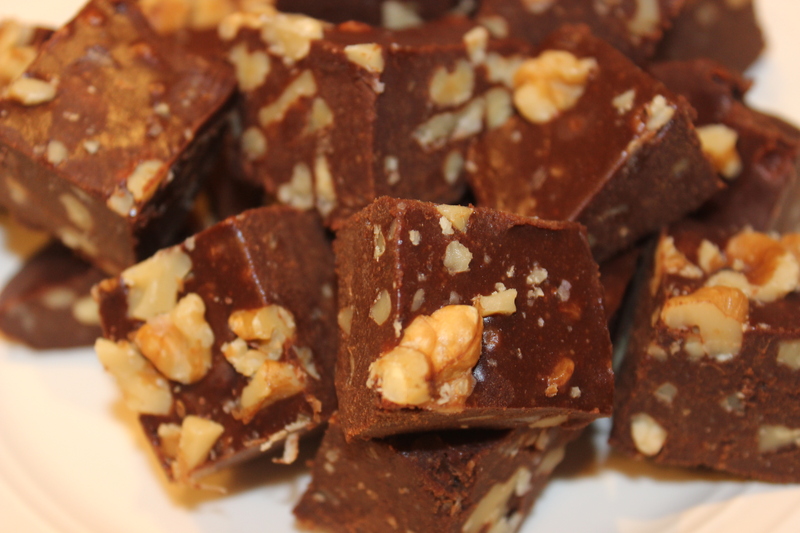 Seductive Raw Chocolate Walnut Fudge – Holy cow. This melt-in-your-mouth fudge is simple to make, loaded with chocolate/walnut/maple flavor and won’t stay around for long! Raw Almond Butter Cups – Almonds. Cinnamon. Chocolate. What’s not to love? When I was a kid, I put parmesan cheese on EVERYTHING. One of the fun things I used to do at dinner was pretend it was “snowing” on the “trees” and coated my steamed broccoli with a generous helping of Kraft parmesan cheese. I wouldn’t eat broccoli without it! Since then, I’ve discovered that cheese and other dairy products were the key triggers for my ear and upper respiratory infections as a child and young adult and can wreak havoc on the body…so no more snowy trees for me. The good news is that I’m feeling so much better now and have gotten rid of those issues completely. I’ll be writing more about my personal experience with the downsides of dairy in future posts (If you’re interested, start watching the video on the link at around minute 5:00). Fortunately, I’ve learned how to enjoy broccoli without cheese. One of my favorite ways to prepare broccoli is roasting it. If you grew up eating overcooked, canned, or steamed-to-death vegetables, give them at least one more chance and roast them. You will be amazed by how delicious and flavorful they are! Broccoli is an incredibly healthy food and is also one of the GBOMBS. Here are just a few reasons why broccoli is awesome and we should eat more of it! It’s anti-inflammatory and detoxifying. Inflammation and toxicity are the two main reasons we are so sick and holding on to extra weight, so we want to do as much as we can to reduce them! It’s rich in fiber. Fiber keeps us full, so we eat less, and it keeps things moving in our digestive system. It contains lutein, which helps to fight heart disease by preventing the thickening of arteries. It’s rich in calcium. Calcium strengthens and promotes bone growth and health, which helps prevent osteoporosis. Broccoli retains the most nutrients when eaten raw or lightly steamed or cooked, but most of us aren’t eating enough vegetables anyway, so it’s better to eat them roasted than not eat them at all, so roast away! Now that we’ve established how great broccoli is, let’s talk about what to do with it. This week in our Hometown Harvest bag, we got a hefty bunch of broccoli, and when I got home from a four-day business trip, I was ready to play in the kitchen and try a new recipe. This garlicky broccoli recipe is going to become a staple in our house. It’s SUPER simple and tasty. You are going to LOVE it. It’s more fitting to call it what it really is…Crack Broccoli. Seriously, it’s that good…you may have to stop yourself from eating the whole darn tray. Don’t say I didn’t warn you! I made a few modifications to the original ingredient list and point them out below. I was eagerly anticipating a long weekend away to the southern coast of Portugal with several friends from my program in Spain…until something awful happened. After all, who doesn’t want to deal with embarrassing GI issues in a foreign country hours away from home and everything familiar? I’ll be honest, it was a pretty miserable and uncomfortable week, and aside from the temporary weight loss, nothing good came of it. I told my Spanish mom, Matilde, that all I wanted was crushed ice and “cookies without sugar” because I didn’t know how to say “Saltine crackers” in Spanish. Well, I was told that ice is “dirty” so I shouldn’t eat it, and I didn’t get anywhere with my description of Saltines. So, aside from some physical discomfort, embarrassment, and frustration, since I had to delay my trip to Portugal, what did my illness mean? Several days of clear fish broth until I felt better. Since I had never really eaten any soup other than Campbell’s less-than-impressive and rather sparse chicken noodle soup and didn’t like seafood, eating fish broth was a real treat. Fortunately, over the next few months, Matilde redeemed the fish broth by introducing me to a variety of other soups and stews that were brimming with vegetables and bursting with deep flavors. They were filling, warming, and comforting. We love soups and chilis now and prepare them almost weekly this time of year. Here are a few reasons why we are souper excited about soup! They’re cheap. Beans, vegetables, broth, greens, and grains are the base ingredients in most soups. They can be purchased in bulk and are really inexpensive. They last for days, which saves time and money. Cook once, eat three (or more!) times. I love finding ways to save time in the kitchen, especially during the workweek. By taking some time to prepare a soup one day, we save ourselves time (and money!) preparing lunch and several dinners during the rest of the week. Now that football season is over, try to commit to making a soup on Sunday afternoon, and don’t worry about prepping dinner until Tuesday at the earliest! They’re healthy comfort food. Comfort food makes us happy because it is reminds us of home, family or friends and often has a very traditional and simple preparation. Soups are warming, soothing, rich and often reflective of our heritage, too, and there is something really satisfying about that. They’re a great way to get in the healthiest foods on the planet, including leafy greens, beans, and onions! Check out this recipe for an amazing Tuscan Bean Soup we made the other day. We incorporated our Tuscan (AKA dino) kale from Hometown Harvest along with other GBOMBS foods like beans and onions. The addition of red wine added a sweetness and richness that I can still taste! As a gift to celebrate my completion of graduate school, my mother-in-law gave me what is now one of my absolute favorite cookbooks. Clean Food: A Seasonal Guide to Eating Close to the Source is written by Terry Walters, a fellow IIN graduate. From the Basic Balsamic Vinaigrette (you will never want store-bought salad dressing again! ), Three Bean Chili, and Roasted Kabocha Squash and Creminis to the Ginger and Pear Crisp and Banana Coconut Chocolate Chip Cookies, we have enjoyed over a dozen of the wholesome, nourishing recipes from Terry’s Clean Food cookbook. Also, for anyone who has food sensitivities or allergies, this cookbook will give you tons of new inspirations and alternatives, and you will not feel deprived or slighted in the least! The Tuscan Bean Soup was the most recent recipe we prepared from Clean Food and is one we will definitely be making again. You can check out other delicious soups posted on my Pinterest boards! Do you have a favorite healthy soup recipe? Feel free to share below! When I was a kid, grocery shopping meant spending Saturday morning with my mom and getting free food samples along with an ooey gooey slice of Mama Ilardo’s cheese pizza at Metro Supermarket. Sometimes, we would venture to Belvedere Market where we would take in the aroma of fresh ground coffee beans and the sweet smell of local fruits and vegetables. When we bought our house in August, the fact that MOMs and (if we’re feeling ambitious) Trader Joe’s were within walking distance was a big selling point. As much as we like grocery shopping, there are times when we want to change things up. And even though we love to cook and try new recipes, our meals can get stagnant sometimes and we may need a little nudge to try something different. A few months ago, my hubby and I found out a super cool service that we just started using to keep our weekly menus exciting. We still go to the grocery store for add-on items, some pantry staples, and sometimes just to explore, but the bulk of what we make during the week is inspired by our weekly delivery from Hometown Harvest. I love finding things that make being healthy easier, more convenient and affordable. We like Hometown Harvest because their produce comes almost exclusively from the local area during the growing season, and they use out-of-area organic family farms in the winter. We know the food is local, sustainable, and safe. Each week, they deliver a customized bag of fruits, veggies and other local agriculture items, like farm fresh, pasture-raised eggs, right to our doorstep. We select our bag contents earlier in the week, leave out a cooler on our porch, and when we wake up on Friday morning, it’s like Christmas and our cooler is magically filled! What was in last week’s bag? Fuji apples, broccolini, dino kale (AKA Tuscan kale), Roma tomatoes, red skin potatoes, avocados, limes, green beans, carrots, cremini mushrooms, red onions and pasture-raised eggs. The cost for all of this (including delivery)? About $45, certainly no more than we would have paid for the same items in the grocery store, especially considering the quality, freshness, and taste. Hometown Harvest recently added lots of other items we plan to try in the future, including meats and fish, dips and salsas, nuts and seeds, grains and pastas, pantry items, and coffee, all from local vendors. You can see all of the options on this page. Here is a map of their service area. If where you live isn’t covered yet, you can contact them through the link on that page and ask them about delivering to your area OR check out the Local Harvest website to find a Community Supported Agriculture (CSA) (great way to save on fresh produce! ), farmer’s market, or other provider of local agriculture near you. Once we have all of our ingredients and know what’s “in our basket,” we get to pretend like we’re on the show Chopped and be creative and have fun with our food! We cooked in coconut oil instead of olive oil (coconut oil is more heat stable, so it doesn’t turn rancid when heated like olive oil does). Didn’t have bok choy so we left it out, but if you have it, definitely use it! Served it on top of a bed of quinoa. Added a squeeze of fresh lemon juice to finish it off. It was a delicious and flavorful meal and full of some of the most nutrient-rich foods on the planet. Have you ever used a service like this or participated in a Community Supported Agriculture (CSA)?